While the asparagus is still local and fresh, you will want to fancy it up now and again for Sunday dinners, or other special occasions. Nothing dresses asparagus like Hollandaise Sauce, and this recipe, which I found online at "Simply Recipes," is “Maximized,” delicious, and (perhaps more importantly) easy. What more can we ask? (I know it looks like the preparation is lengthy, but once you read through, you will see how simple it really is.) Prepare this sauce just before your meal. Preparation:1) Melt the butter slowly in a small pot. Try not to let it boil – you want the moisture in the butter to remain there and not steam away. Once the butter melts, turn off the heat and let it cool just a little bit while you prepare the eggs. 2) Add the egg yolks, lemon juice, salt and cayenne (if using) into your blender. 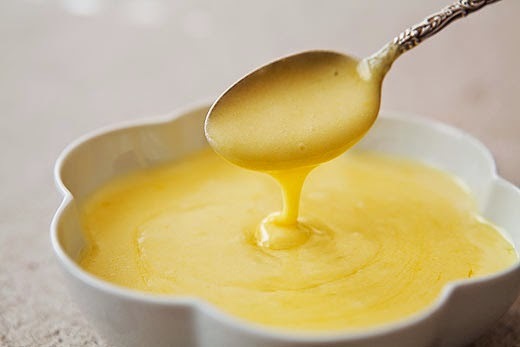 Blend the egg yolk mixture at a medium to medium high speed until it lightens in color, about 20-30 seconds. The friction generated by the blender blades will heat the yolks a little. The blending action will also introduce a little air into them, making your hollandaise a bit lighter. 3) Once the yolks have lightened in color, turn the blender down to its lowest setting (if you only have one speed on your blender it will still work), and drizzle in the melted butter slowly, while the blender is going. Continue to buzz for another couple seconds after the butter is all incorporated. 4) Turn off the blender and taste the sauce. It should be buttery, lemony and very lightly salty. If it is not salty or lemony enough, you can add a little lemon juice or salt to taste. If you want a thinner consistency, add a little warm water. If you do this, pulse briefly to incorporate the ingredients one more time. Store until needed in a warm spot, like on or next to the stovetop. Use within an hour or so.Makes about 1 cup of sauce, good for about 4-6 servings.